When we think of a role model our mind may immediately associate this with a famous athlete or movie star. The truth is, when you look in the mirror you’re looking at a role model. Did you know that? How about when your kids look in the mirror? Do you think that’s what they see staring back? There are crazy overwhelming benefits to our kids being a role model. it’s easy to place an age restriction on such a title. What we need to realize is this title comes with a level of positives that can rock our kids worlds at any age. Benefits to our kids being a role model…. An amazing tool for empowerment, self esteem and reinforcing good decision making is assuming the role of a role model. What is a role model? It’s someone that provides an example (whether good or bad) to someone else. It’s one person looking up to another. This is a tool that, quite frequently, is overlooked and underutilized. I believe we can be empowered as well as our kids when we take the time to connect that, “hey, someone is watching you.” They’re watching your actions, your words, your attitude and how you live life. Think about that for a few minutes. It can be a sucker punch sometimes to think about the example we are setting. Sometimes we can hope that no one is watching, but guess what eyes are on us as our ears. The vibe of accountability and being someone’s hero..
We’re human and we’re bound to screw up. Do you want to know what can decrease the level screw ups? When, in the back of our mind, there is the realization that someone is watching, that our words and actions actually matter.There is power in knowing that how we roll with life matters to someone. So here’s the positive. There’s always room for improvement. If we switch gears with what we or our kids are doing wrong and replace it what with they’re doing right accompanied by the potential they have to rock someone’s world it can be life altering. They are empowered in crazy amazing ways. Let me give you an example. A few weeks ago I had a dozen senior guys and girls chat with their entire freshmen class about the power of good decision making, staying true to themselves and respecting who they are. It was powerful. I was in awe of their words, passion and compassion. I watched these 17 and 18 year old guys and girls get personal, share struggles and accomplishments and challenge their 14 year old peers in ways no public speaker, class lesson ever could. Eyes and ears were on these seniors because, guess what? They’re role models. The 14 year olds were challenged and empowered by the 18 year olds. The 18 year olds were empowered by their realizing how powerful their words really were. As a parent, dialogue with your young person about what they’re proud of about themselves and then share what you’re proud of about them. Hone in on these positives. 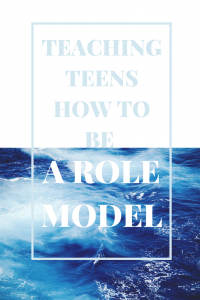 Seek out ways for your young person to have opportunities to be a role model. Whether that’s with younger siblings, cousins, etc.This is about forming a sense of positive peer pressure. Making good decisions, feeling really good about who you are strengthens our identity and outlook on life. If and when we feel as though we have no value, bear no contribution to anything our self worth is shaken. It’s important to feel valuable, that we contribute something to someone. This is where being a role model comes into play. It truly is empowering. Whether as a student, athlete, member of whatever activity, hobby…their words, their behaviors can better those around them or weaken. Our presence matters. Remind them of this. Empower them. They matter. Their actions matter.This isn’t about leadership. Not everyone was born to be a leader. Instead this is about being more than we think we are. Rising above. Encouraging others. Going beyond with the realization that someone’s life was impacted positively because of you. There is so much to gain with our kids realizing their potential, their abilities…. Being a kid is really tough, but there are ways to make it easier and to strengthen who they are. This is one positive way. If you take on this approach I can say confidently, it will enhance your child and your family. It’s a no lose situation that merely takes a little effort, adjusting of the sails and consistency. It can be done and accomplished with amazing benefits. decreases risks for poor decision making. I encourage you to rock out this strategy. There’s truly no downside to it. Let’s empower one another. Let’s allow our kids to gain the knowledge that they can make a huge impact in crazy ways.You can do this!